We understand the bond that grows between owner and dog. It’s likely that you have shared your home for many years and shared many family milestones. Pet hardly seems the right word for a family member. Each dog that enters our lives fills our hearts with warmth and joy, creating a special bond which deserves to be remembered. This is why, at CPC, we feel privileged to be chosen to help support you and explain the dog cremation options available to you. 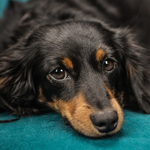 Whether you need us to collect your departed dog from your home or veterinary practice we are on hand to provide a cremation service your dog deserves. You can also choose to attend your dog’s cremation and bring his or her ashes home on the same day. To discuss your requirements call one of our trained bereavement advisors. We welcome all dog owners to attend their dog's cremation. At all of our crematoria we have a customer reception and viewing room where you can say your final farewells and, if you choose, you can watch your dog being placed into their own cremation chamber, via CCTV. Dogs are truly our best friends. They are sent here to love us unconditionally; anyone that has shared their life with a dog knows this simple truth. Dog cremations start at £139 for a small dog. 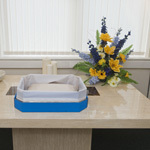 We offer a range of containers for your dog's ashes. 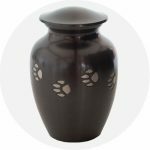 The range includes our paw print urn - you can also choose from our range including photo frames, urns, wooden caskets and jewellery.